Today I’m celebrating Sugar Spun Run’s 4th (un)Birthday* with nothing other than the BEST Birthday Cake Recipe. 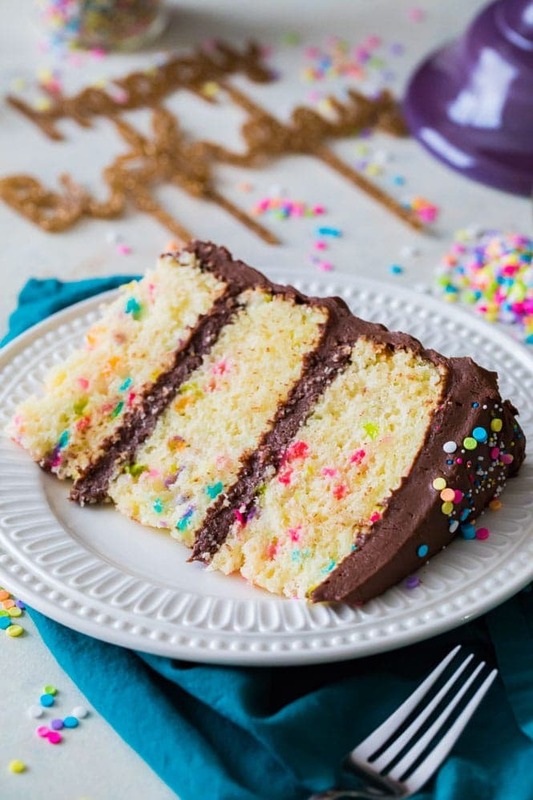 A classic, soft, and fluffy vanilla yellow cake loaded with colorful sprinkles and frosted with my favorite chocolate cream cheese frosting (though I include other possible frosting substitutions)! Today marks 4 years of Sugar Spun Run, and we are celebrating with Birthday Cake! 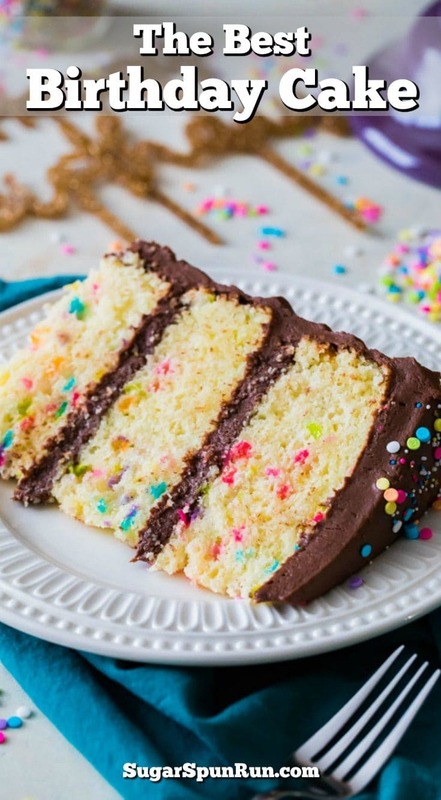 This is a soft, fluffy, moist (sorry), yellow/vanilla birthday cake speckled with colorful sprinkles and covered with a thiiiick coating of chocolate frosting. It’s not the same as my vanilla cake recipe (though I’m dying to hear if you like it as much as that one! ), it’s actually an adaptation of my vanilla cupcakes, and it’s so good. I desperately wanted to share this one on Zach’s birthday a few weeks ago, but he insisted on my chocolate cake instead, probably because he knew it would be pointless for me to try to sneak any sprinkles in there. 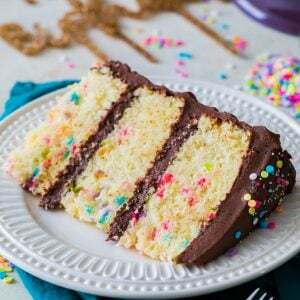 This is a classic and uncomplicated 3 layer homemade Birthday cake recipe that’s surprisingly simple to make. Let’s get started. The sprinkles that you see in my pictures are pastel candy quins — flat, disc-like sprinkles. If you’re wondering, these are the exact sprinkles that I use (affiliate). 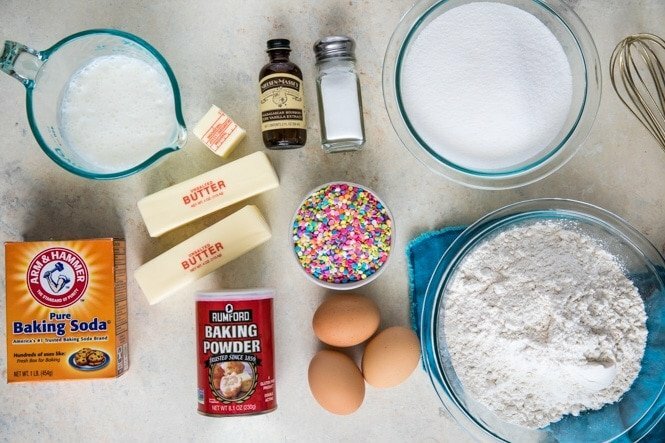 However, classic colorful sprinkles or “jimmies” will work just as well in this recipe. One thing I do not recommend is using non-pareils; the tiny colored ball-shaped sprinkles. These are unfortunately likely to bleed through your cake, turning it an ugly gray color. With most cake, cupcake, or muffin batters, mixing can make or break the ultimate texture of your baked good. It’s important that you stir well enough that all ingredients are completely combined, but don’t stir too much or your cake will be dense and dry. For best results, use a spatula to frequently scrape down the sides and bottom of the bowl, that way you don’t have any pockets of un-creamed butter or un-mixed flour. 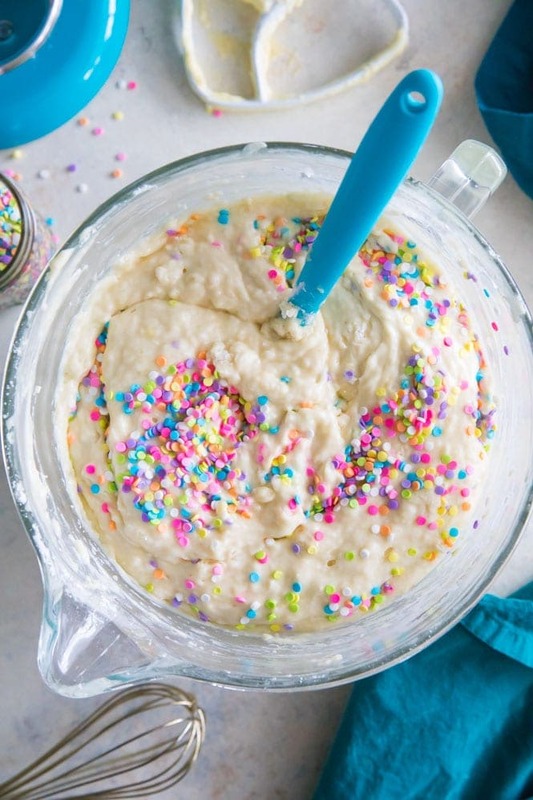 Using all room temperature ingredients will also encourage your birthday cake batter to combine properly. Alternating adding your dry ingredients and your buttermilk (or buttermilk substitute) to the batter will ensure that everything combines better than if you were to add either of these ingredients all at once. When stirring in your dry ingredients and buttermilk, make sure you do this step by hand, using a spoon or spatula, and not using an electric mixer. 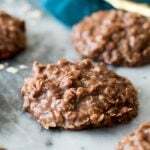 An electric mixer is much more likely to over-work your batter, leaving you with a dense/dry crumb. A cake that’s been in the oven for even a minute or two too long runs the risk of being dry and crumbly. For best results, check your cake a minute or two before it’s supposed to be done. The cake should spring back when lightly touched and a toothpick inserted in the center should ideally come out with a few moist crumbs. If it comes out clean, it’s definitely done, get it out of the oven ASAP. Over-baking can also happen if your oven runs too hot. I’ve never owned an oven that ran at the temperature that it said it was, it’s always either been too hot or too cold. To make sure I’m always baking at the proper temperature, I keep two inexpensive oven thermometers (affiliate) in my oven at all times. If your oven is even just five or ten degrees too hot, it can dry out your cake before it’s even supposed to be close to finished. I tested this birthday cake recipe using equal amounts of all purpose flour and cake flour and was satisfied with it both ways. Using cake flour will give the cake a slightly lighter, softer texture. When measuring your flour, make sure that you never pack it into a measuring cup. Stir the flour, then use a large spoon to spoon it into a measuring cup before leveling it off with a straight edge (like a knife). For best results, use a kitchen scale and weigh your ingredients, it’s easier, produces fewer dishes, and guarantees accurate results. This is the kitchen scale I use (affiliate, I promise I didn’t mean for this birthday cake post to be a bunch of Amazon links but look what’s happened). All of the alternative frostings listed above were designed for 2-layer cakes. If you’d like to use one for today’s recipe, just be sure to increase the frosting recipe by 50% so that you have enough to cover this entire 3-layer cake. Alright, now that we’ve covered our Birthday Cake basics, I need to thank you. Thank you, thank you, thank you, from the bottom of my heart, for sticking with me over these past four years (or even if you’re new, thank you for finding me and for staying!!)!! Thank you so much to everyone who reads these posts, comments, shares them on social media or Pinterest, or watches me on YouTube. Thanks to you, Sugar Spun Run isn’t just a hobby, it’s my job (which is just the craziest thing in the world to say), and I couldn’t be more grateful. 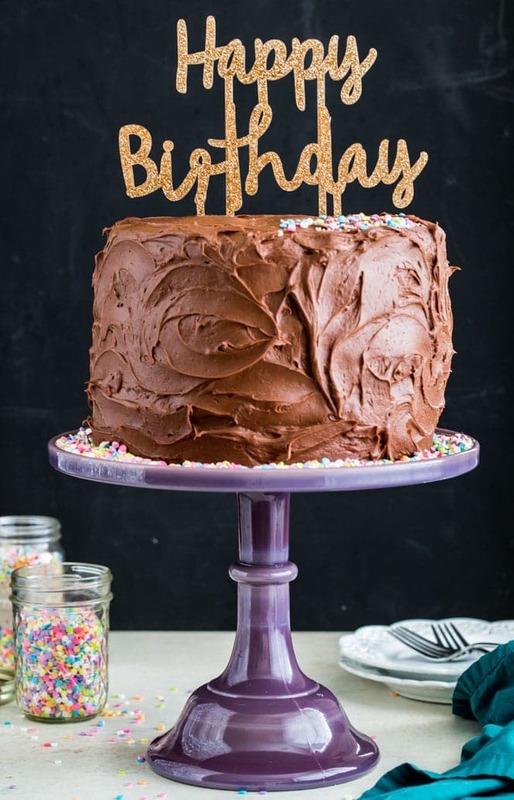 *You can check out my previous (un)Birthday celebrations (and learn why I call it an “Unbirthday”) in my Funfetti Cake Recipe and in last year’s Cookie Dough Pops post. The BEST classic Birthday Cake Recipe. 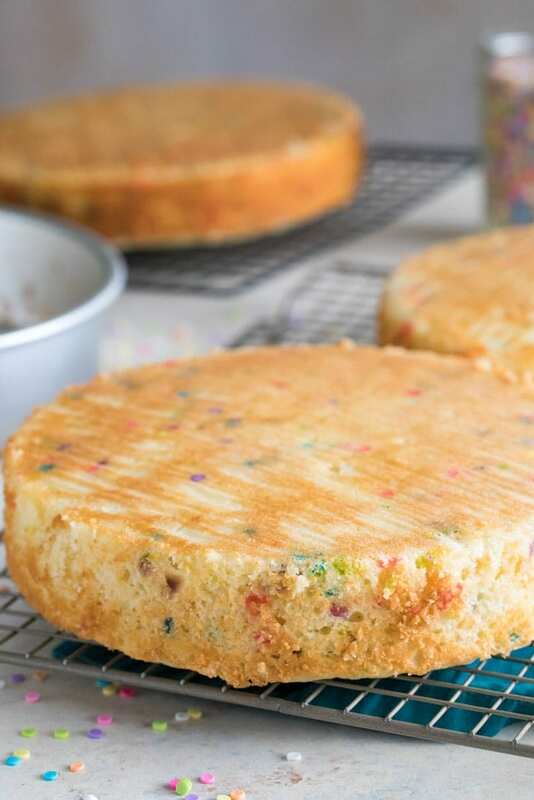 A soft and fluffy vanilla yellow cake loaded with colorful sprinkles and frosted with chocolate cream cheese frosting. 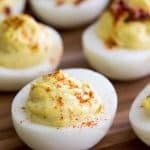 Make sure to check out the how-to VIDEO at the bottom of the recipe! Preheat oven to 350F (175C) and grease and flour the sides and bottom of three 8” or 9” baking pans. For extra security I also recommend lining the bottom of each pan with a round of parchment paper cut to fit the bottom of the pan. Add butter to the bowl of a stand mixer or to a large bowl. Use a paddle attachment on your stand mixer or an electric mixer to beat until smooth. Add sugar and beat until well-combined. Using a spoon or spatula (but NOT the electric mixer any longer) add about a fourth of the flour mixture (no need to measure, just eyeball it) to the butter mixture and stir until just combined. Now add approximately ⅓ of the buttermilk and stir again until combined. Repeat alternating adding flour mixture and buttermilk until all ingredients are completely combined. Be sure to scrape the sides and bottom of the bowl. Evenly divide batter into prepared pan. Transfer to 350F (175C) oven and bake for about 28 minutes if using 9” pans and 32-34 minutes if using 8” pans, or until a toothpick inserted in the center of cake comes out clean or with a few moist crumbs. Allow to cool in pan for 10 minutes then run a knife around the edge of the pan and carefully invert each layer onto a cooling rack to cool completely before frosting. While cakes are cooling, prepare frosting. 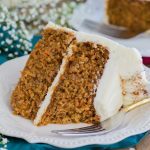 You will need a large bowl, this recipe makes a lot of frosting to cover all three layers of cake! Combine butter and cream cheese in your stand mixer or in a large bowl with electric mixer and beat until creamy and well-combined. Gradually, with mixer on low-speed, add powdered sugar (check out my video below the recipe for tips on doing this without making a giant mess of your kitchen!). Once all sugar has been added, stir in cocoa powder. Be sure to scrape the sides and bottom of the bowl so that all ingredients are well-incorporated. ¹If you don't have buttermilk on hand, check out my easy buttermilk substitute (all you need is regular milk and lemon juice or vinegar). ²I used colorful "quin" (sequin) sprinkles but standard sprinkles or "jimmies" will also work. These are the exact sprinkles that I use (affiliate). The cake will also be fine (though sadly less colorful) if you leave out the sprinkles entirely. However do not use nonpareils, the tiny ball-shaped sprinkles. They are likely to bleed through your cake. ³If you don't want to do a chocolate cream cheese frosting, please see my post for alternate frosting suggestions. Just be sure that if you use one of the suggested alternatives that you increase the recipe by at least 50% to be able to cover the whole cake. This is the Gold Birthday Cake Topper that I used (affiliate). Happy Anniversary Sam! Thank you for the worst cookies ever! My favorite😊 Have learned a lot from you! Thanks! Would love to make these as cupcakes. Any advice? Hi Becky! This recipe will work as cupcakes, don’t fill them more than 2/3 full and they’ll need to bake for about 17 minutes on 350F. This recipe is actually based off of my vanilla cupcake recipe if you want to check that one out instead.